If you are like most, your company priorities are constantly changing and your site gets pulled along with those changes. New products, re-branding, promotions, newsletters, the list is endless. And somewhere in the midst of all that noise, clear customer paths can get lost and the whole purpose of your web site can be dampened. If you are setting out to provide a product or service, often the path to that product or service is overtaken by all of the company efforts to sell products. It is all quite ironic.Lastly, with the onset of multi device usage, it is more and more important to focus your site towards web standards to accommodate your users and make their visit to you site familiar and easy to navigate. You won’t be able to stop all changes to your site to re-strategize. But you can take a look at customer paths to the actions you want them to take and work to clear those paths. Managing a corporate web site is not for sissies. You have to line up with corporate strategy and revenue goals and guide content contributors accordingly. This can be very tricky. Is the one thing we want customers to do, still a clear path on our site. For example, is buying from us easy? Accessing promotions, logging off and on our site no matter what browser? Sometimes the most basic functionality gets broken amidst all the changes. Does our method of reviewing products and services and buying – the cart style, etc., fit all of our demographics? Have we added technology that we need to remove to clear the path for older folks or does our site only accommodate millennial or phone shoppers? Research continues to support that yes, 60% plus are viewing sites on mobile devices, but many still transact at home on their desktops. Which brings me to the next review item. Does your mobile app, mobile site, tablet and desktop experience work together? Or are you making assumptions for all mobile or desktop sales? Responsive design allows for a flexible experience, but is not perfect. Make sure you know the devices your key prospects are using and cater to them. 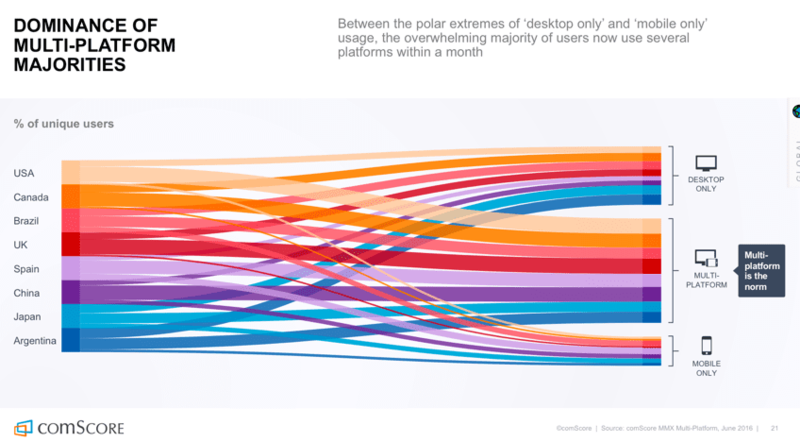 The below Comscore chart shows that somewhere between desktop and mobile, the majority of users are now using several platforms within a month. What is your target market using and are you reaching them optimally there? When people arrive on your site, do they know what you do? Is your logo posh and hip from a design stand point but say nothing about what your company actually does? You only have 3-5 seconds to engage online, especially initially so make your logo say something about what you do and support it with tag lines/imagery that make it clear. Is it easy to share your site and articles on the top social media properties? One share can expose you to thousands of new prospects. Make the social media icons obvious and easy to access. Does your site use design and content best practices? The world of web standards has not reached perfection, by a long shot. But there are strong trends based on usability and providing a consistent experience for web users world wide. This Orbit Media article provides strong visuals that show you the direction to take. 50 is a LOT of standards. Just tackle 5 at a time and you are on your way to a more effective web site. It is human nature to resist change. And this includes changes to a corporate web site! As with any change process, provide information to your content providers to support a shift towards web standards and best practices. Information moves people over the change “hump” in organizational development and it will work to smooth resistance to changes on your site. Make sure your VP of Sales knows why the product area has been rearranged, or the content rewritten. Be sure your operations team supports the changes to how shipping options appear. Educate and gain buy in early and often and you will have success increasing the effectiveness and results of your site and overall web presence. If people understand the “why” behind the direction you are going, they are more likely to support the change. Marketing Sherpa, Marketing Profs, Social Media Examiner and Media Post are all great sources for informative web site design and strategy articles that you can share with your team leaders. The Digital Girl Friday site is full of informative articles on most aspects of online marketing, including how to optimize a site. The above best practices article is a great place to start. Good luck and let me know if I can help you through your site review and improvement process. I just want to tell you that I am just beginner to weblog and definitely savored this web page. Most likely I’m likely to bookmark your website . You actually come with exceptional posts. Thanks for revealing your website page. I simply want to say I am new to blogging and site-building and definitely liked this web page. Probably I’m going to bookmark your blog post . You amazingly come with really good well written articles. Thanks a lot for sharing with us your web site.